Hey everybody, Scott here with MCP.com thanks for coming back, today is part 3 and Key #2 to becoming a successful consultant as a software developer, we’re going to talk about writing blogs and staying busy on social media, stay with me. Ok, so today in our third part of the six part series Key #2 as I’ve said already is writing for blogs and staying busy on social media. And one thing I wanted to say about this, is this is good old fashioned marketing. If you’re stepping out into the wild, wild west of consulting and contracting and selling your services in the big world I think you need to have some presence online. I think this is obvious to a lot of people but for somebody, like me, I probably spent a decade of running this business with relative indifference. I mean, we have a site and I have some personal social media stuff but I didn’t really engage to the depths that I am going to suggest that you do. So I want to tell a quick story about having a presence online. I had written an article, and I’ve written several articles over the years in various magazines and stuff, but in this particular one and this goes back almost ten years, and it was a very short article encouraging people in the AS400 world to experiment with Java and use a particular IDE called Netbeans to do that and a couple of months after that article published (and this is still print magazine at the time, although I guess now it’s also online) MCPressonline is what it’s called today. The article itself was just talking about Java and encouraging people to get started with it and I got a call from a company here in Tennessee not too far from here…. First I got emails, then I got calls. We talked on the phone many times and then there was a site visit. And because of their interest in me through this article that I wrote they thought I could come and bang out a bunch of Java code which is exactly what happened. I had just short of a two year arrangement with them and it was a big step for our company and it still didn’t dawn on me in a way it should have. I mean, I was able to connect the dots that this article equals this result but I didn’t keep doing it until much later and I wrote quite a bit later but anyway what I’m trying to say is sometimes pouring cups of water into… sometimes it feels like pouring cups of water into the sea of social media and it doesn’t feel like you’re making a big splash but little by little if you stay consistent and you post on social media, you start your own blog, you say stuff on linkedIN, short articles directing people to your blog, you know Twitter is one that’s popular in a lot of technology in people’s minds, Facebook and Instagram. At the risk of missing any of the social media platforms I’ll just say, that your Facebook business page, your blog, and other people’s blog that you can write for, is extremely important and as I said, it’s just good old fashioned marketing. I’m going to cheat and look at my board here a bit, because there’s so much content in this series. So It’s never too early or too late to start, right? So for me like I said I had relative indifference I didn’t dislike social media I just wasn’t in love with it at the same time. So I didn’t pay a lot of attention to it. So this year, in my efforts to grow our business I’ve taken a much deeper interest in social media and plus I really wanted to help people take the steps I’ve taken probably with a little more efficiency because when I’ve started as I’ve said in a previous video there just wasn’t as much material out there mapping and charting the course and so my Youtube channel and my blog is about that. A significant part of that is motivated so that I can help other people do some of the things I’ve done, and then you know maybe I can benefit from it in some way, but if I can help other people in some way that’s a big deal. So, writing for other people’s blogs, writing for your own, and start a blog and it’s never too early or too late to start like I said. If you’re just beginning or you’re still working in your corporate job go ahead and do it, it doesn’t hurt. I’ve heard some stories where people have completely changed their lives through the publishing of their own blog and having consistent out there and that kind of stuff so. It’s a big deal. It’s difficult to say this = money but this does equal money and having an online presence is a big deal when you’re selling something today. You need to have your own website, your blog, you need to keep busy with your social media stuff, in addition to keeping your skills sharp from a previous video and to keep building your business savvy as you go along and this is part of that. So that’s a little bit about posting for blogs, having a blog, using social media to your advantage. What I wanted to do with this video, what I want for you to take away from it is, it’s important and don’t ignore it. Work it into your busy schedule, make sure you have a rhythm to putting stuff up on social media, and you can see very clearly that I’ve chosen Youtube as a big part of it and my blog. 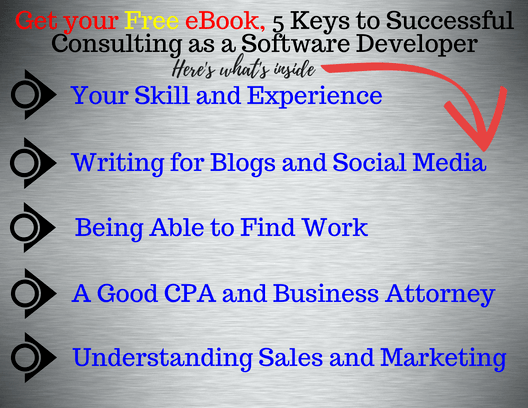 So, go to motivatedcodepro.com and check out the blog post for this video, and sign up so you can get the whole E-book emailed to you that covers all 6 sections and the 5 keys to becoming a successful consultant as a software developer. I am Scott with Motivated Code Pro, please Like, Subscribe, Hit the Bell, and keep coming back.